Having seen several images of this general location over the past few years I must admit: I simply love this view. And so getting a decent shot of this scene became important to me. 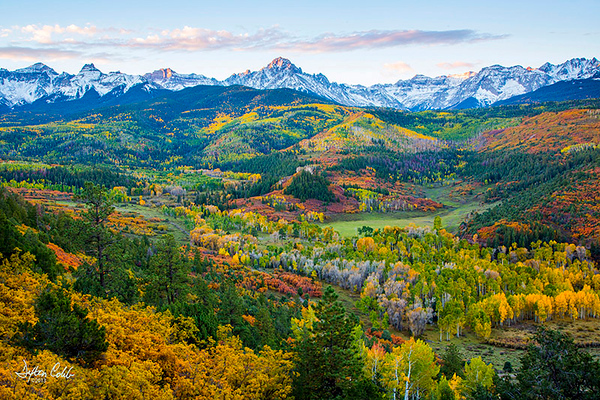 See Jack Braur’s rendition at http://www.mountainphotography.com/photo/sneffels-range-autumn/ as a classic example. Back in 2012, Casse and I shot this area to no avail, but I learned from the experience that the scene does not lend itself well to photography with direct sunlight upon it; diffuse light works best. We met painter Jay Moore who was there painting while we were photographing in 2012. See http://www.jaymoorestudio.com/portfolio/mount-sneffels/ for Jay’s rendition. It turns out that there is a “secret ingredient” in the recipe (of course). You have to climb down the hill to get around the foliage blocking an unobstructed, expansive view. Well, thankfully, I did some midday reconnaissance a couple of days beforehand and happened upon an Ol' Timer who, upon inquiry, told me about this trail leading down the hill. I asked about snakes and bears and he said the snakes are non-venomous (snake phobia here!) and the bears, though rarely seen, are brown bears and generally won’t bother you unless you scare ‘em (don’t wanna be no bear’s breakfast either!). Upshot: sing or carry a bell and you’ll be OK.
Can you see the cows grazing below? A two stop hard grad was used in this shot.